1. Preheat oven to 200C. Prick the potato/s all over with a fork and place on a baking tray. Cook for 35-40 minutes then turn off the oven but leave the potatoes in for a further 10 minutes. 2. Meanwhile, shred the white and dark chicken meat and place in a bowl. Add the yoghurt, chipotle paste, red onion and sweetcorn. Mix well. 3. Take the potatoes out of the oven, split open and top with the chicken mixture. 4. Serve immediately, with salad. Sweet potatoes are full of nutrients and are an excellent post-workout food. It is delicious paired with a bit of spice and protein-rich chicken. The dark meat is used in this recipe due to its higher nutrient content – dark meat contains a lot more zinc, iron and potassium for example, than breast meat. If you are limiting calories, use a mix of white and dark meat to lower the fat content. Looking for some Vitamin A? Look no further! 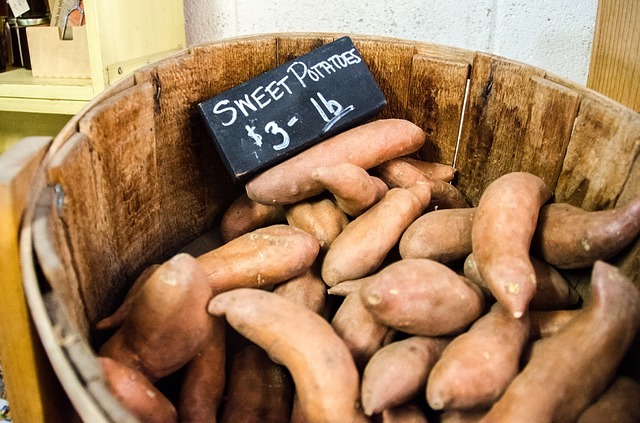 Sweet potatoes offer more than 400% of your daily Vitamin A requirements in just one spud! Packed also with plenty of potassium and fibre, as well as vitamin C and vitamin B6. A super source of beta-carotene, sweet potatoes also provide you with folate, vitamin E, zinc, phosphorus, calcium and iron.